Once in a while, a new story about bread. Another story about bread, part of the Sourdough Series. In case you haven’t read it, take a look at the first article. In this series, we talk about sourdough bread. For those who’ve never heard of it, it’s bread made with natural fermentation — it only takes water, flour, salt, and time. I spoke with Filipa, a Portuguese graphic designer known as Sufragista. She started making bread one year ago. Her boyfriend started it and the results — fluffy tasteful long lasting breads — made her want to give it a try too. Filipa managed to create a starter at her first attempt. “I used a recipe from Ikea book. I used rye flour mixed with regular flour. 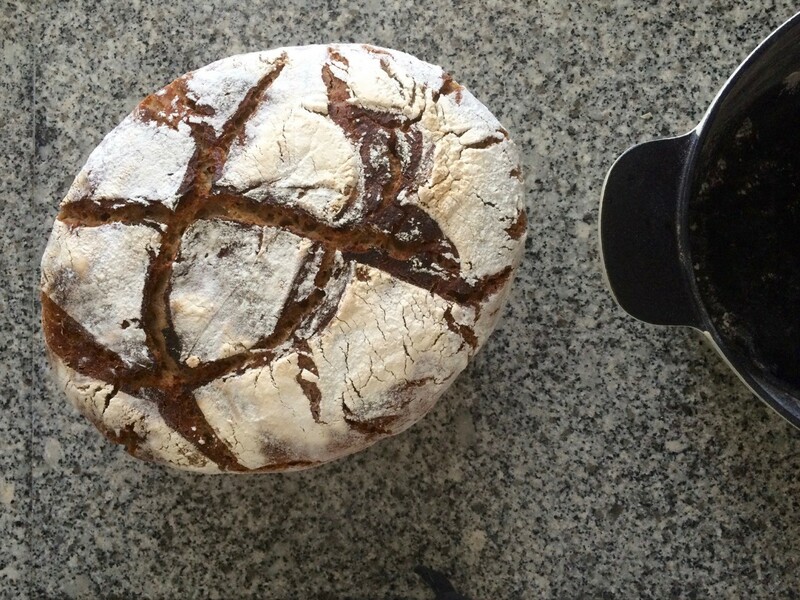 At the moment, I use Tartine’s recipe, which combines a mix (50/50) of regular flour (T65) and wholewheat flour. To maintain it, I keep it in the fridge and feed him from 5 to 5 days. When I want to bake, I take it out and feed it twice a day”. She has learned that if the starter doesn’t pass in the water test, i.e. it doesn’t float, you shouldn’t use it. For a perfect interior and crunchy outside, the fermentations are crucial, mainly the first one, the so called bulk fermentation, in which you turn the dough every 30 minutes. “It’s very important to develop the air bubbles. As for the crust, baking the bread in an iron cast is essential to have it crunchy and caramelized”. Filipa says that, aside from plastic boxes for the starter and some baskets for the fermentation time, the iron cast is definitely the worthiest investment. So far, the biggest learning has been to fit the method into her life scheduling, plus the best way to make it work in her kitchen, because of its temperature. 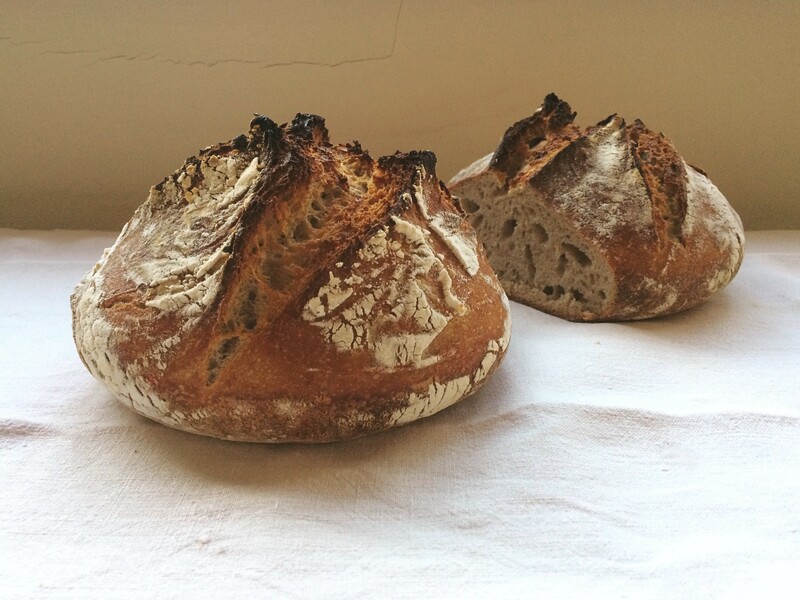 “I found out bread grows much more when I make both fermentations in the fridge”. If she had to select a go-to recipe it would be Wheat-Rye 10%, from Tartine — Book nº3. “It’s a wheat bread with 10% of rye bread. It goes well almost every time and I enjoy the flavour. I’ve also tried to switch wheat flour for spelt flour and it also turns out good. It’s important to sift your wholemeal flour, so the dough doesn’t exceed in bran”. So let’s say it is always a win! This is the second of a series of posts about sourdough bread. You may also like to read the previous ones, with Inês. Writing while eating a banana. Everything related with food and the act of eating, its cultural feeling, the comfort, the recipes, the making at home with our own hands.